(Denver, Colo.) – April 3, 2019 – Cherry Creek Beer Garden, the neighborhood‘s largest outdoor patio space that is adjacent to Cherry’s Creek’s hippest hotel, Moxy Denver Cherry Creek, announced today that it will officially open for the summer season on Friday, April 12 with a monster kickoff party. In addition, Cherry Creek Beer Garden is unveiling its summer series of events, including the return of uber-popular weekly offerings Brewery Nights, Yappy Hour Fridays and Mmm.. Sundays, as well as special events that highlight the spring season and local Colorado artisans. Summer will officially kick off in the Beer Garden with the Cherry Creek Beer Garden Launch Party on Friday, April 12th, from 4:00pm to 8:00pm. Guests can enjoy beers and live music by DJ 2AR while sampling bites from the Beer Garden food menu that launched at the end of last season. Yappy Hour Friday: Beginning April 19th, dog owners are encouraged to bring their pups to happy hour at the dog-friendly Cherry Creek Beer Garden every Friday from 4:00pm to 8:00pm. Dogs will enjoy dog-friendly beer options of Bowser Beer and Porky Pug Porter, dog treats, and toys, while their humans indulge in deals on select sausage bites and $5 grab cans. Mmm.. Sundays: Kicking off with a launch party on April 28th, "Mmm... Sundays" will be hosted every Sunday in the Cherry Creek Beer Garden from 11:00 am - 3:00 pm. The event captures the true spirit of Sunday Funday with cocktails, food, garden games, live DJs and all you wish to drink Bloody Mary and Bellini packages starting at $25. Brewery Nights at Moxy: Moxy has partnered with local Colorado breweries and will offer specials on selected beer cans and free shwag from the featured brewery of the month. Great Divide Brewing Company will be the featured brewer for May. Kentucky Derby Pre-Party, Friday, May 3rd from 5:00pm – 8:00pm: Start the celebration early at Moxy with Mint Juleps, and canned beer specials. Paint and Sip, Thursday, May 23rd from 4:00 pm - 7:00 pm: Moxy has partnered with a local studio for a fun evening of painting and cocktails. Cherry Creek Beer Garden is Cherry Creek’s largest outdoor space, accommodating nearly 100 people and featuring four community tables and stadium seating around several fire pits. While there are six beers on tap, as well as wine and cocktails, the theme of Cherry Creek Beer Garden calls for rotating selections of canned beer exclusively from Colorado. A food menu launched at the end of last season elevates the beer garden experience with dishes such as Seasonal Greens, Roasted Beet Salad, Mountain Charcuterie, Bacon Jam Minis and more. Cherry Creek Beer Garden will be open Monday through Friday from 3pm to 11pm and Saturday and Sunday from 11am to 11pm. For more information on hours, location and special events visit www.cherrycreekbeergarden.com or on Facebook or Instagram. 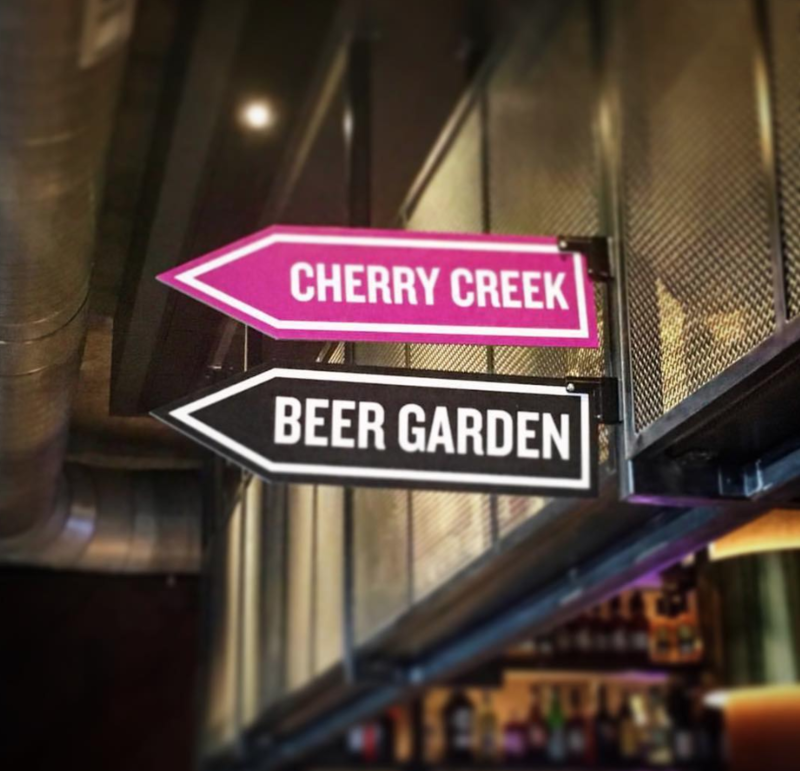 Located adjacent to The Moxy Hotel, Cherry Creek Beer Garden is a pet friendly place to drink beer, grab a bite and hang out in a beautiful and rustically chic outdoor scene. Cherry Creek Beer Garden is a destination for smart people who prefer their craft beer in a can, so each one is cold, crisp and fresh. For more information and hours of operation visit www.cherrycreekbeergarden.com.